To celebrate the 5th birthday Reus, we finally got round to make the soundtrack available... properly! For the ancient native Americans, the PINK MOON heralded the blooming of the first spring flowers: the 'pink moss'. For us, it heralds the blossoming of the second GODHOOD FULL MOON UPDATE! As Godhood has been progressing nicely, we have found this to be the perfect time to go from the Alpha stages of development and testing into Beta! A true moment of, frankly arbitrary, celebration! Rick here, back bearing prophecies of another weekly update. Let's jump right in! A big update brimming with changes to the newest build as we go from alpha to beta! A livestream of us playing the new beta build on our very own Twitch channel! Access to the Pink Moon update beta build (for backers at tiers granting alpha/beta access)! On Thursday, the first Inside Godhood podcast in which I talk to project lead Adriaan about the Early Access! The next Full Moon update will be on Wednesday April 17th, and not April 22nd. That way alpha testers will have the weekend to try out the new build. So check back here April 17th for a big update and a stream of the beta build! The WORM MOON marks the thawing of the ground, the coming of the worms and, like clockwork, our first ever Godhood FULL MOON UPDATE. As of this writing we have JUST put the new alpha build (lovingly called the WORM MOON build) online! If you are an alpha tester, either through the small random selection or having backed at a level of Chieftain or higher, you will be getting an e-mail inviting you to join. We have an automated program sending out e-mails with REUS & Renowned Explorers keys constantly. Check your e-mail for the hard-earned gifts of the Social Stretch Gods! Hi again young gods! Big news! While we didn't quite reach the monetary goal (yet! ), we got close enough with the help of late backers that we decided to go ahead and start development on the Beastwalker & Harbinger disciple classes! Think of it as us pushing us that final little bit as thanks for all the support shown so far. Get ready to level your disciples up into ferocious Beastwalkers and terrifying Harbingers! It's been a little bit! Kickstarter-fever is starting to wind down here at the Abbey, as we patiently wait (read: eagerly develop Godhood) while Kickstarter processes the funding you graciously chose to support us with. In the meantime let's use this first weekly update to take a look at how Godhood's shaping up! Remember, we will get back to backers regarding the fulfillment of rewards (including keys to Reus & Renowned Explorers) as soon as Kickstarter is done processing the campaign funds, which could still take another week and a half or so. Thank you all so much for your support during this Kickstarter. Because of your help backing and spreading the word, this Kickstarter's gone far beyond anything we could've hoped for! Thanks to all your support, the Kickstarter campaign for Godhood has succeeded! Let's go over where we go from here. Which platform you want to receive digital rewards (Steam or GOG). How you'd like to appear in the credits. If you have access to the alpha periods, we'll need your proper credentials to give you said access. if you backed on tiers allowing you to name / design content: specifics of your design-ideas. If you're here you most probably know our new game Godhood is being Kickstarted right now. We're making something very special and we want to work on it for years to come. In order to do that it's very important that we reach as many people as possible with this campaign. If you're looking for ways to help us out other than pledging your support in the Kickstarter, then this thread is for you. First of all a big thank you for your interest and willingness to help! While backing the project itself is the strongest support you can give us, there are other things you can do to help Godhood become a success. The Godhood Kickstarter is live! Here's how you can help..
We've gone over Your Rituals, The Sacrament, Your Disciples and Creating Your Religion already. We've gone over Your Disciples and Creating Your Religion already. This time we'll talk more about the Sacrament. Hi young Gods! It's Rick again. The world of Godhood is one filled with diverse tribes that worship many different deities, of which you are but one. In order for you to raise your God Level you'll need to convert these tribes to worship you instead. In the mythical world of Godhood this happens through the ritual conflicts known as Sacrements. This time we'll talk about your Disciples. Hi young gods, Rick here again! Your Godhood deity is not all-powerful. You’re an idea that exists within people. As such, you affect the world through your Worshippers and your Disciples. Worshippers form the masses that, in their prayers, raise your God Level and increase your power. Converting new Worshippers to your religion is one of your primary goals in Godhood. The ones to do so are the Disciples. These powerful apostles are skilled in the Sacrament: a ritual conflict between two religions that determines which God is strongest! 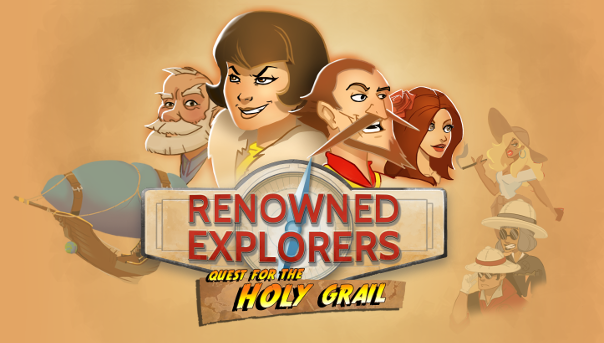 The third and final expansion for Renowned Explorers: Quest For The Holy Grail, the Soundtrack, the Art Book and the Renowned Explorers: Definitive Edition are out... now! The expansion contains a new expedition in which you follow in the spiritual footsteps of a certain whip-wielding archeologist in search for the ultimate treasure in the Middle-East. Meet mysterious Djinns, alluring belly dancers and even some spoiled cats! And what are those dastardly Anti-Explorers up to this time? The best part: this new expansion will be completely free for all current and future owners of the Renowned Explorers base game! The DLC should be granted automatically after tonight's update. Quest For The Holy Grail FREE DLC, Definitive Edition on December 13th! This new expansion will contain a new expedition in which you follow in the spiritual footsteps of a certain whip-wielding archeologist in search for the ultimate treasure in the Middle-East. Meet mysterious Djinns, alluring belly dancers and even some spoiled cats! And what are those dastardly Anti-Explorers up to this time? The best part: this new expansion will be completely free for all current and future owners of the Renowned Explorers base game! At the same time, we will also be releasing the two oft requested extras.